A data field is essentially the field header in your subscriber list (basically the first column in your spreadsheet). Data fields tell WordFly which data you’re importing with your subscriber list. For information on applying a data field to your email template, how personalization works, as well as other tips, go to the Learn More section. Is it possible to edit or delete data fields? 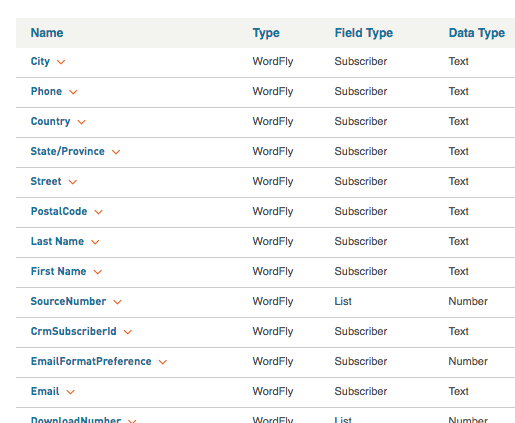 Some data fields already exist for you in WordFly, those are all marked as type "WordFly". Here's the list: City, Country, Crm Subscriber Id, Download Number (Tessitura), Email, Email Format Preference, First Name, Last Name, Phone, Postal Code, Source Number (Tessitura), State/Province, Street. Learn more about WordFly's default data fields in this support post. There are two types of data fields you can create and use in WordFly: List data fields and Subscriber data fields. List Data – Data that is specific to a list and changes often, e.g., Performance Name. List data fields are not saved to a subscriber's record in WordFly because the data is based on a list by list import. Subscriber Data – Data that is specific to a subscriber and rarely changes, e.g., Email address, first name. Subscriber data is saved to subscriber records in WordFly. You could import First name in one list and WordFly can use that data for future emails without it being imported on the list again. If you have a field header in your list and there isn’t a correct match for it in WordFly, you’ll need to create a new Data Field in WordFly before you import your list. 2. Click 'Create a custom field'. Type a descriptive name for your data field into the Name field. Select a Data Type from the drop-down: Text, Number, or Date. If you select either Number or Date another drop-down will appear to customize the format for this type of data. (Optional) Type a brief description of the data field. Important note: Be sure to only use alphanumeric characters for your data fields. Special characters such as parentheses, commas, and quotes can break your list imports. Dashes, spaces and underscores are acceptable in the data field name. 4. Click Save to add the data field to your library. Only custom data fields can be fully edited and deleted. WordFly default data fields and Preference data fields cannot be edited or deleted. Descriptions on any data field can be updated. 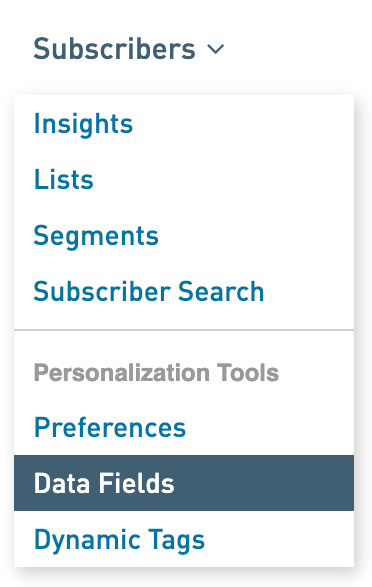 To edit a data field go to Subscribers > Data Fields and find the data field you would like to edit. Click the name of the data field on the left side. Then select one of the options available (either View/Edit or Delete). To edit the data field select View/Edit. Custom Data fields created in your account can be deleted. Preference data fields can only be deleted under Account > Preferences. Important Note: When a data field is deleted any emails that use that data field will no longer be able to pull data into the view email as webpage version of the email which is dynamically created when loaded. To delete a data field, select the name of the data field and select "Delete" from the drop-down.